Noble Mystique is a high quality line of gentle moisturizing products, formulated with natural ingredients. Noble Mystique products help to relieve dryness and itching, while maintaining your skins healthy appearance. They may be used to help control irritated skin conditions between applications of more potent products. Noble Mystique products do not contain mineral oils and are not tested on animals. Noble Mystique Body Cleanser is a natural soap substitute. Noble Mystique Emu-Lac Hydrating Cream is a moisture replenisher for dry skin. 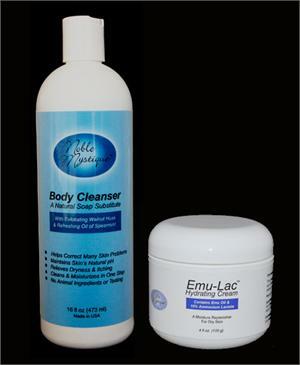 It contains emu oil and alpha hydroxy acids (10% ammonium lactate).